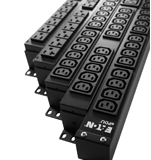 Eaton Basic ePDU is designed for reliable and cost-effective power distribution and have the form factor and receptacle choices to meet the needs of the demanding data center architect. With power levels ranging from 1.4 kW all the way to 17 kW, Eaton has the right Basic ePDU for any application. Clearly labeled circuits simplify load balancing.